Cottage Zapala - After serving four generations, one family's quaint and much beloved East Beach Cottage gave way to a new, larger structure that better accommodates its ever increasing members. Personalized features of the home draw from the family's Sapelo Island roots and highlight the essence and history of the Golden Isles. Inviting tabby tiled porches, front and back, usher friends and family into a spacious great room, defined by lofty dormers and white shiplap wood walls. This area incorporates the kitchen, dining and living areas. A balcony overlook with a herringbone hardwood floor, custom railings and lights connects the upper two bedrooms to the community area below. 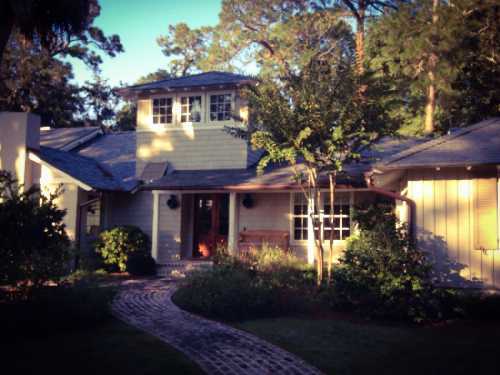 Key windows were purposely placed to capture the canopy of the nearby live oaks. Custom made bead board cabinetry of knotty alder, shiplap walls of knotty pine, custom moldings, and dark rustic oak floors reflect a vintage beach cottage style. Touches of pecky cypress recovered from the Altamaha River appear throughout. All three bedrooms are unique. The downstairs master bedroom has a private porch with access to the yard and pool. The second level master bedroom has a custom pine tongue and groove ceiling and French doors leading to a private screened porch overlooking the pool. The third bedroom has shiplap walls, a bead board ceiling and windows on three walls that give the room a sleeping porch feel. Repurposed from the original home is a rare (and fondly remembered) 42 inch square mid-century cast iron bathtub. The swimming pool features a seven foot sun shelf that allows for cool comfortable relaxation in the shallow water. Reclaimed brick steps provide additional seating poolside. 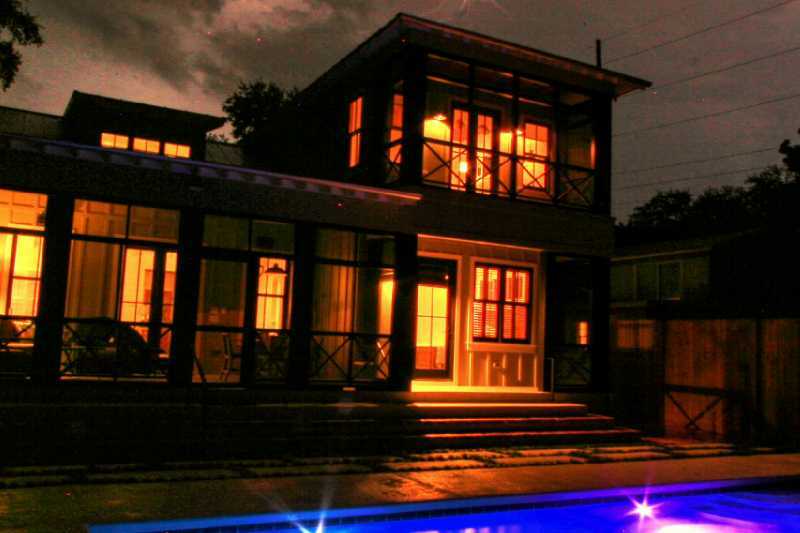 Exterior lighting of the home is downcast to minimize light pollution of the glorious night sky. The beauty and custom details of the home are the result of a collaborative effort of designer Liz Murray of Renovate Design and builder Ken Rogers of Rogers Construction. Every generation will love this charmer! Since 1872, the Keeper’s Dwelling has stood as the historic companion to the St. Simons Lighthouse. The Dwelling was home to the lighthouse keepers and their families from 1872 until 1953, when automation of the lighthouse relieved resident keepers of their duties. 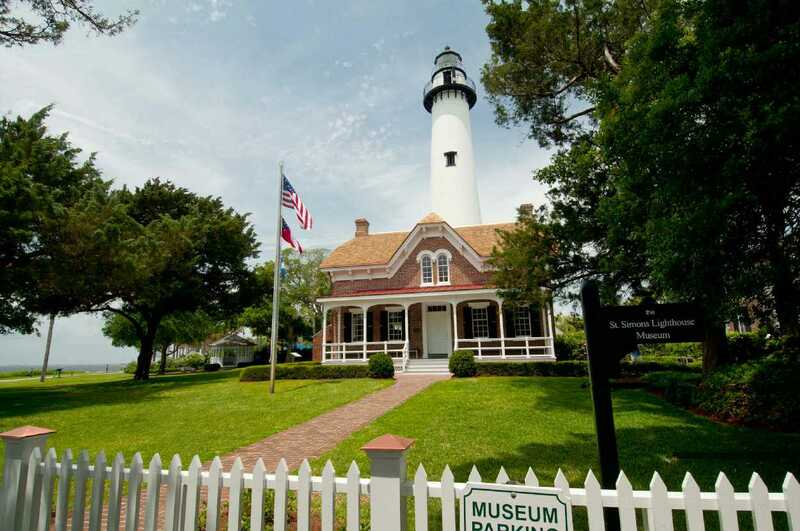 For the last 36 years, it has welcomed visitors as the St. Simons Lighthouse Museum. The Lighthouse and Dwelling were designed under the direction of Orlando Poe, one of America’s foremost lighthouse engineers. Noted Georgia architect Charles Cluskey constructed the brick dwelling and 104-foot tower. The Lighthouse features a 129-step cast iron staircase and a French-made Fresnel lens, which casts its beam as far as 23 miles out to sea. After careful restoration in 2014, the Keeper’s Dwelling reopened with newly installed exhibits interpreting the lighthouse site and providing an overview of local history from Native American settlement to the present day. Historical images and period artifacts are displayed along with iPads and other interactives to enliven the story of our area. On the second floor of the Dwelling, period rooms reveal the home life of the keepers at the turn of the 20th century. A “country club” setting in the heart of St. Simons has all of the ingredients for a “staycation” year around. A totally fenced corner provides such privacy that tennis matches, swimming laps, or hanging out in the tree house can be accomplished without any intrusion from the outside world. The main dwelling has all of the elements of refined elegance and casual aged appearance that provide universal appeal. In fact, much of the décor has been inspired by Swedish influences which define casual elegance. Whitewashed brick floors combined with a beige and taupe color palette give immediate stress reduction to the senses. In the living room, a square beamed ceiling with grass-cloth inserts is a clever way to add interest to the room. Several round shaped shell balls are an additional feature. The kitchen with a concrete counter leads into a den/keeping room which used to be a carport. Straight beamed ceilings, travertine marble floors and pretty pale blue-green color accents provide calm in an activity-centered area. A lovely vintage Swedish chest provides for useful storage. Three bedrooms with individuality reflected in their décor are across from the living area. Once again, lovely tones of blues and greens are used throughout. A wonderful antique buffet has been adapted into a lavatory in one of the bathrooms. A Man’s Study complete with leather upholstery and golf theme is a perfect oasis from the activities of a busy family. A back hall leads to stairs covered with sea grass and which lead to the Master Suite upstairs. The Master Bath features all of the components anyone could wish for including an original Lee Catts oil painting. A wonderful vista of the backyard completes the picture. An at home office is situated in a wide hall across the back of the house. Behind it is hidden access to a play room where the younger family members can enjoy media in all expressions; play games; and generally chill out. Throughout the house are several paintings by Ester Deen, Yasharel Manzy, J. Saul, and Jamart. There is a separate guest house where total privacy prevails. In addition to all of the above, the homeowner is a leading interior designer so many professional, but personal touches abound. This property is an amazing treat to visit! 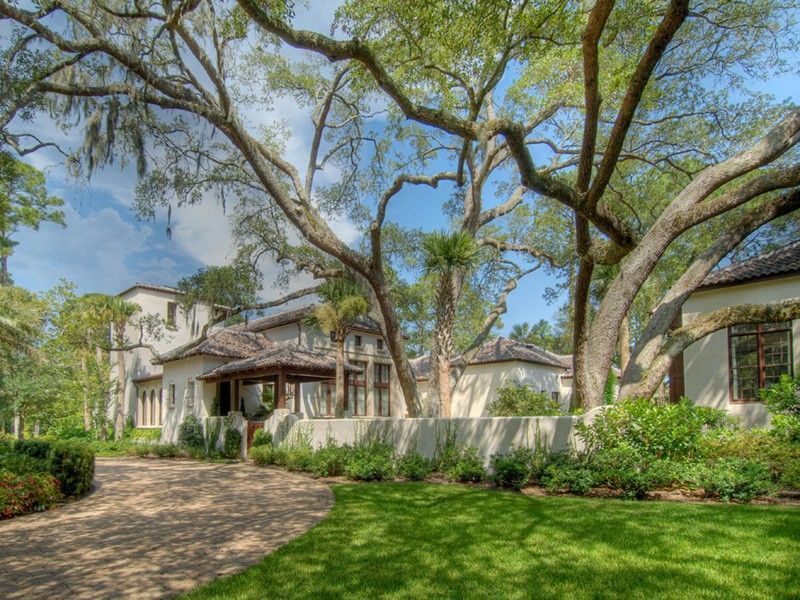 E. 11th Street, Sea Island - A lifetime of past memories and future ones to be made is what this magnificent house is all about. Mary-Bryan Peyer, of Mary-Bryan Peyer Designs, worked closely with the owners and architect Ward Seymour to create a beach-front haven for the entire family. This home has been loved by the family for more than fifty years and is evidenced by the numerous pieces of art and artifacts from the family’s worldly travels. Children, grandchildren and pets are welcome here, as no space is too precious for family fun. The interiors reflect the homeowner’s joyful personality with the abundant use of colors throughout. Colors and patterns are found in wallpapers, rugs, fabrics, light fixtures, bed linens and accessories. Each bedroom suite has its own personality that exudes fun. The house was remodeled in 2013 with an updated kitchen, new bathrooms and the addition of two grandchildren bedroom wings, one south and one north. 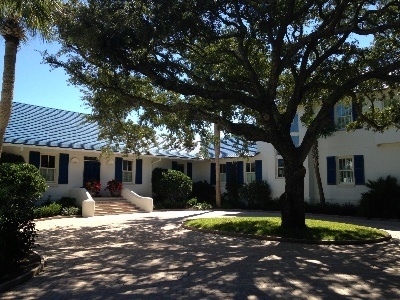 The design team was intent on keeping the interior’s original cottage feel of the home, including the exterior view from the beach that is known for the original blue tile roof. There is plenty of patio and pool space for the family and friends beach-side. Deep seating club chairs and chaise lounges abound with colorful pillows and umbrellas. E. 17th Street, Sea Island – A 1970’s vintage tabby has become a charming country French cottage under the capable creative forces of John Shackelford and Nancy Stoddard. The entry foyer was a wonderful addition to the front exterior of the house. An 1850’s era antique French bombe′ chest complete with marquetry and ormolu sets the tone for the house. An antique Delft lamp and mirror can be admired also. The living room has a beamed ceiling and pine floors. Wonderful faux painting on the walls completely fools the eye and looks like intricate wood paneling. An antiqued glass “mirror” above the fireplace mantel is divided in half so that each half can slide outward to reveal a large TV or remain closed when not in use. Blue and white Chinese import Canton porcelain provides splashes of color and focal points around the room. The blue and white theme is repeated in the fabrics as well. Comfortable seating and a card table provide the accoutrements for a multi-use room. A convenient bar is tucked into a built-in cabinet. Two guest bedrooms are located on the left side of the house behind the living room fireplace. A charming sunroom across the rear of the house overlooks the pool and patio. The blue and white theme in assorted shades and designs is continued here and a tile floor provides a color contrast as well as a practical choice for wet feet. A master bedroom leads off from the sunroom and overlooks the pool area as well. Two additional bedrooms continue behind the master suite where a bonus room with spill-over sleeping quarters and sitting area are combined in an addition that was part of the renovation. The kitchen and keeping room run across the front of the house and overlook an intimate courtyard with lush plantings and a small bistro table and chairs. A vintage armoire serves as a pantry and is adjacent to the dining area. Many ideas are packed into this cottage. It beguiles and bewitches in every way! 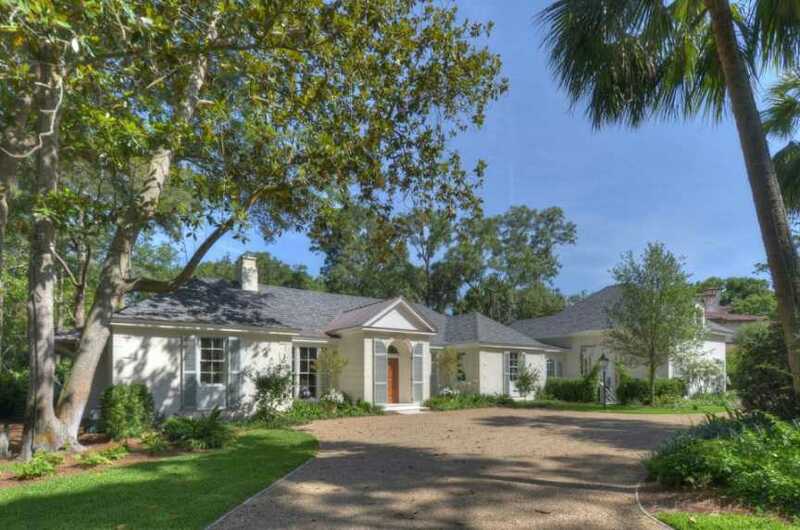 W. 21st Street, Sea Island – This former 1950’s tabby ranch has had a complete transformation under the expert design work of Laurie Watson, with Mary Bryan Peyer Designs, and Jack Davis, architect. Original brick floors in the entry are about the only remnants from the original house with the exception of the view. The entry has a raised ceiling with clerestory windows for natural light. A panoramic vista of the marsh has been obtained by the addition of a great room which has breath-taking views from every direction and wonderful “washed” pine beams. Crisp, white shiplap walls and subtle taupe and cream variations are used to provide a unifying design throughout the house. Splashes of color create a signature for each room to add a distinct “look” throughout. Wide “washed” pine floors coordinate with the horizontal design of the walls. Unique antler ball-shaped chandeliers in the great room give a casual feel. Poured concrete counter tops in the kitchen and in the bathroom sinks are another interesting use of material. The use of subway tile backsplash in the kitchen is another clever repeat of horizontal lines. A wonderful sliding barn door hides the pantry as well as to give maximum use of the space inside. A master suite plus three additional bedrooms are in the main house. Shiplap vaulted ceilings give a feeling of spaciousness and add dramatic height. There are several areas for quiet reflection including a wonderful porch off of the kitchen and a sitting area for the guest rooms. A separate garage apartment has two additional bedrooms and living room. A pool and a dock for crabbing add additional touches for complete enjoyment of the property. And, not to be outdone, it has its own osprey nest! E. 24th Street, Sea Island - “Noontide” is a spacious, modern three storied Spanish Colonial which replaces a vintage Sea Island Cottage. It retained a separate structure from the original house which is now used as a guest house. 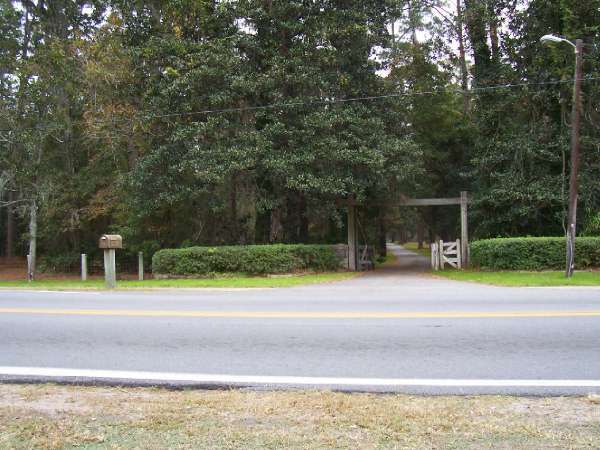 The two are connected by a walled courtyard which is home to old growth live oaks and other lush landscaping. A massive iron framed wooden gate with a fleur-de-lis is the entry point and leads to the porch entrance into the foyer of the main house. A large two storied living room focuses on a massive fireplace and a wonderful intricately wooden detailed ceiling and Spanish-style chandeliers. A dining area adjacent has cathedral-windows with a pecky cypress ceiling. The kitchen is conveniently placed at the end of the living room where an overhanging balcony from the second floor frames it from the living room. All of these rooms overlook an elegant porch with arched columns, automatic screens and its own fireplace for all weather living. The master suite also connects to the porch where it also overlooks the back yard with a tiled pool surrounded by a knee wall and steps inviting guests to the spacious yard adorned with magnolias, oaks, palms and hollies. An additional guest bedroom is behind the kitchen area. Stairs leading upstairs have Moorish design tile risers which add color as well as continuity to the Spanish motif. Handsome light fixtures and other wrought iron touches are tastefully used throughout. Two spacious guest bedrooms, an office and a sitting area complete this second story level. Another set of stairs with wrought iron railings goes up to the third level or “crow’s nest” where a luxurious media room and wet bar complete the main house. The guest house across the courtyard has two additional bedrooms and living room and small kitchen and features the original door of the original cottage. This one has it all! The Christ Church cemetery predates the original church building, which was completed in 1820. The earliest identified grave is circa 1800. 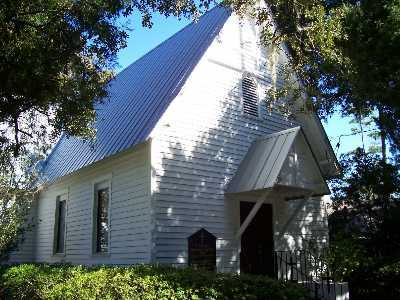 The property was deeded to Christ Church by the state of Georgia in 1808. 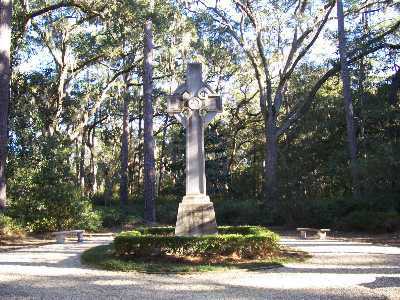 For many decades, it was the only church and cemetery on the island, with the exception of private cemeteries on the plantations. The cemetery contains the remains of Revolutionary War veterans, politicians, Civil War soldiers, early settlers, entrepreneurs, plantation owners, former rectors, and nationally recognized authors. This year, we again bring to life our historic cemetery with a formal tour as one of our stops. At stations throughout the grounds, re-enactors will tell the stories of some of the interesting personalities buried there. You will meet some of our most interesting cemetery residents. We are excited to share the history of our parish, and what better way than to share the stories of members throughout the centuries.